This compact, newly-arrived 21ft Bay Boat, powered by a single 150HP four-stroke outboard, is the perfect boat for inshore fishing for one or two anglers. It has an 8ft beam for stability, two live wells, plenty of dry storage areas, a top-of -the-line Humminbird Sounder/GPS, and VHF radio. 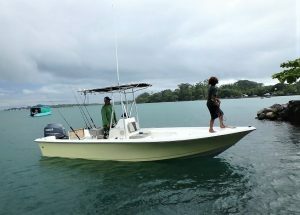 The boat has a large casting platform on the bow and stern, making it ideal for casting and for fighting fish.